Damjan Pelc, Petar Popčević, Miroslav Požek, Martin Greven, and Neven Barišić, Science Advances 5, eaau4538 (2019). During three decades since the discovery of high-temperature superconductivity in cuprates, a lot of theoretical models explaining particular aspects of these complex materials have been proposed. However, only in a last few years the experimental results showing unambiguously some important general properties of cuprates have emerged. The key role in achieving these results have been played by our scientists, and up to now these results haven’t been theoretically modeled. The work published in Science Advances proposes a phenomenological model which in a comprehensive way interprets the results of these experiments. The key elements of the proposed model are that the electronic system in cuprates may be divided in two components – delocalized and localized, that the delocalized part behaves according to the conventional theory of Fermi liquids, that the localized states are separated from the Fermi level by energy gaps, and that these gaps are inhomogeneous in space as a consequence of intrinsic disorder. The developed model in a simple way quantifies the experimental facts, yielding deep implications. First, it leads to the understanding of electric transport across the entire phase diagram of cuprates, including the precise description of nontrivial dependence of conductivity on temperature and concentration of charge carriers. 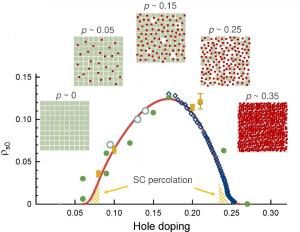 Moreover, it explains the behavior of the density of superconducting carriers through the phase diagram, showing that the localized component is needed for superconducting pairing. The proposed model is thus a very important step in investigations of cuprates, since it yields the comprehensive framework for understanding their universal properties. Figure 1 shows experimental and modeled dependence of the density of superconducting carries at 0 K as a function of the hole concentration in cuprates. The process of gradual delocalization of localized carriers by doping in depicted schematically. Figure 2 shows experimental (left) and modeled (right) phase diagram of a cuprate La2-xSrxCuO4, obtained from the second temperature derivative of the resistance. The diagonal red line in experimental phase diagram corresponds to the structural transition not included in the model.